AP School Annual Day Celebrations Guidelines 2019 | AP School Annual Day Function Rc.No.SSA/30/2019-MIS-SEC Dated: 21-03-2019. AP Schools Annual Day Celebrations Instructions for Head Masters, AP SSA Vijayawada Primary Schools, Upper Primary Schools School Annual Day Celebrations 2019 - Instructions - 2019. APSSA Vijayawada - Celebration of Annual Day in all the Primary and Upper Primary schools in the State - Instructions issued - Regarding. Therefore, all the Project Officers are requested to issue necessary instructions to all the Head Masters for the celebration of Annual Day in all the schools and also release the above mentioned amount to the schools concerned. The expenditure may be met from the head of Composite School Grant. Annexure : District wise and Total Budget for Annual Day Celebrations 2018-19. 1. All Government Primary and Upper Primary Schools in the state should organize Annual Day celebrations. 2. Annual Day may be organized either before or after completion of annual examinations. 3. Head Master/Teacher should prepare the documentation of Annual Day celebrations. 4. Head Master/Teacher should submit a copy of the report to the School Complex for observation. 5. Preferable time of Organization of annual day would be in between 3pm and 9:30 pm. 6. Invite SMC Members, parents, philanthropists, alumni and other community members for School Annual Day. Ensure involving members of all social categories. 7. Donors under Badi Runam Thirchukundam (BRT) shall be specially invited and involved. 8. Ensure the involvement of SMC members and all parents and appraise them on school development. 9. Aware on Right to Education Act among all the participants. Ensure 100% enrollment and retention of children in the age group of 6-14 years. 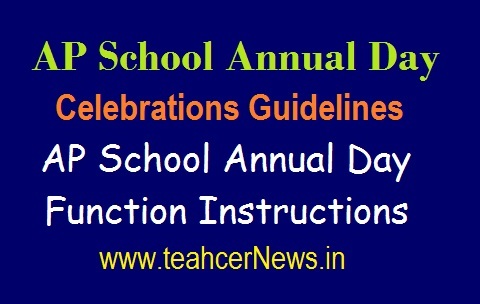 School Annual Day Celebrations Guidelines 2019 | AP School Annual Day RC 30 Dt. 21-03-2019. AP Primary, UP and High Schools Sanction Amount Download.